Experience a throwback to an era when you came to Panama City Beach for a view of the “World’s Most Beautiful Beaches.” A time when watching visitors cruise Front Beach Road, and to simply take in the sights and sounds of this magical area. Cherished by guests for decades as Peeks Motel, this destination has been renovated, and renamed Palm Grove, to offer no-nonsense accommodations directly on the shores of the Gulf of Mexico. And at a price that will actually allow you to enjoy your stay while experiencing all the food, fun and entertainment Panama City Beach provides. Before the shores of the Gulf gave way to high-rise condominiums that eclipsed the views of the “World’s Most Beautiful Beaches”, life was a little simpler. A little slower. And this is what Palm Grove is about. Slowing down to enjoy life and not getting caught up in fancy appointments. But, getting caught up in the amazing scenery of Panama City Beach. Palm Grove offers an outstanding value that doesn’t keep your budget from the FUN on Panama City Beach. You’ll find plenty to do, see and eat along the coast. 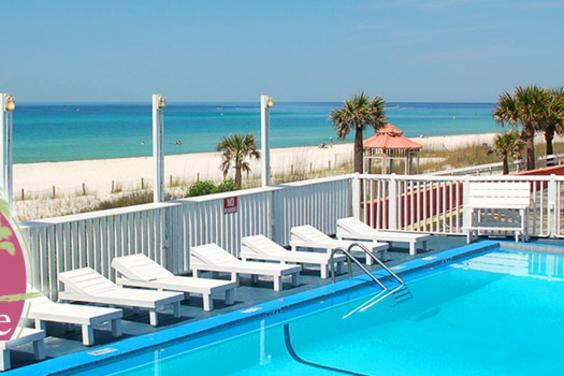 When you want to get away, but not from your budget, experience Panama City Beach at Palm Grove. Visit PalmGrovePCBeach.com for information and to book your room today!